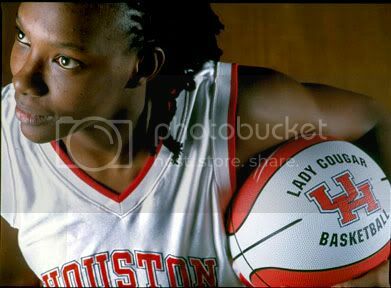 Senior Sancho Lyttle was picked Fifth in the 2005 WNBA Draft by the Houston Comets with their first pick of the draft. Senior Sancho Lyttle became the second Lady Cougar in school history to be taken in the first round. The fifth pick is the highest a Lady Cougar has ever been selected. In 2004, Chandi Jones was drafted in the first round at the eighth pick. Lyttle who finished the season leading the nation in rebounds. was chosen with the Comets first pick behind Janel McCarvel (Charlotte Sting), Tan White (Indiana Fever), Sanodra Irvin (Phoenix, Mercury), and Kendra Wecker (San Antonio Silver Stars) respectively. Coach Joe Curl who was on hand at the Comets Draft party offering commentary on the draft picks with Cheryl Swoops said, "We are so glad that Sancho can stay close to home. We love that her fans from the University of Houston will get to see her play at the next level, where she will continue to grow as player." Kami can give up on regular profession and get into sports reporting. Have a great day.